Apr. 1980 Joined Tomoegumi Iron Works, Ltd.
Apr. 2011 Deputy Manager, EM Business Unit, JEOL Ltd.
Apr. 2014 Full-time Director, JEOL Ltd.
Jan. 1991 Staff Scientist, Materials Science Research Department, Lawrence Berkeley National Laboratory, U.S.A. The recipients realized soft X-ray spectrometry while completely eliminating previous movement mechanisms, such as those which move the spectrometer (diffraction grating) and detector on a Rowland circle. This was done by fixing the diffraction grating and using a CCD as the detector, while exploiting the dispersion characteristics of an aberration correction type diffraction grating produced through R&D led by Japan. This merits special mention in the history of X-ray spectrometry. The world’s first soft X-ray microanalyzer equipped with his spectrometry system was successfully commercialized, and 15 units have already been shipped. These systems offer the most useful means of analysis for elucidating the behavior of lithium molecules in lithium batteries, regarding which there have been concerns due to the detection of Li-Κα X-rays. This technology is already widely used in public and private research institutions in this and other areas. For above reasons, Dr. Takahashi, Dr. Terauchi, and Dr. Koike have been awarded the 15th Yamazaki-Teiichi Prize in the Measurement Science and Technology field. The electron microscope has a history of close to 90 years, and has made extensive contributions to research in many fields of R&D through observation and analysis of microscopic regions. In developing these microscopes, many types of spectrometers have been developed, such as the energy-dispersive spectrometer (EDS), the wavelength-dispersive spectrometer (WDS), and the electron energy-loss spectrometer (EELS), for purposes such as elemental analysis, structure analysis and state analysis, but all of these have been devised and developed in the U.S. and Europe. WDS in current use have good resolution, P/B ratio and quantitative performance, but they require time for energy scanning. Regarding this point, EDS has high speed due to parallel detection, but its resolution is inferior by one order of magnitude. On the other hand, in the field of soft X-ray spectrometry research, progress has been made for many years in Japan in developing sophisticated technologies, such as development of diffraction gratings. Against this background, there have been expectations regarding the fabrication and development of Japan’s own spectrometers. In 1983, in order to contribute to research on soft X-ray sources for applications such as X-ray lasers and plasma diagnostics, Kita et al. obtained design guidance from Namioka, and developed a plane imaging type soft X-ray spectrometer which can simultaneously perform spectroscopic measurement of multiple characteristic X-rays using a previously developed spherical surface with grooves at unequal intervals made using mechanical line engraving. In 2000, Terauchi et al. installed this spectrometer into a transmission electron microscope for the first time in the world, and obtained an energy resolution of 0.3 eV or more at B-K emission. However, the energy region that can be covered by a single diffraction grating is narrow. In order to realize a system for the purpose of basic research and practical use, there was a need to mount/replace multiple diffraction gratings optimized for each energy region, and thereby expand the energy region with a single spectrometer. For this purpose, joint research was started in 2002 by Tohoku University and Japan Atomic Energy Research Institute (JAERI, currently Japan Atomic Energy Agency (JAEA)). Shimadzu Corporation fabricated two varied line spacing spherical diffraction gratings designed by JAERI based on the aspherical wave holographic exposure method, and this enabled measurement over the wide range of 70∼2000 eV. Next, a project was launched in 2008 with the aim of developing a commercial system by JEOL Ltd., Tohoku University, JAEA, and Shimadzu Corporation. JAEA was in charge of spectrometer design and diffraction grating design/evaluation; Shimadzu Corporation was in charge of diffraction grating fabrication; Tohoku University was in charge of prototype diffraction grating and spectrometer evaluation; and JEOL Ltd. was in charge of commercial spectrometer and system development. Thus, to enable measurement of the range from 54 eV (Li-K emission) to 3.8 keV (Te-L emission), which has been difficult to measure using conventional spectrometry, optimal design of the diffraction grating was carried out so that four diffraction gratings can work in a single spectrometer with an improved P/B ratio and sensitivity. In terms of software, emphasis was also placed on tasks such as application software development. 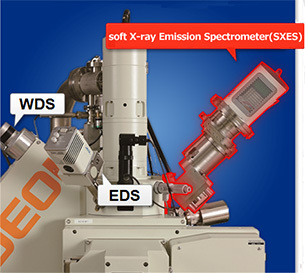 The current commercial system (SXES) is equipped with two diffraction gratings, and spectroscopy is possible in the range of approximately 50∼210 eV. Also, observation by scanning electron microscope has recently become possible at an accelerating voltage of a few hundred volts. 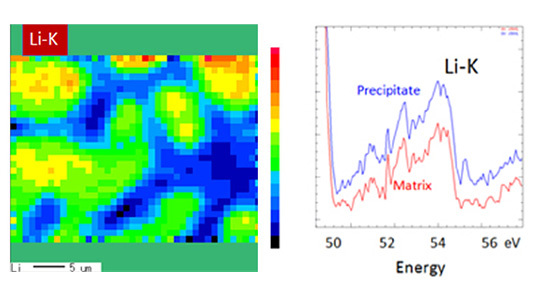 Thus, it is possible to conduct a spectroscopy mapping with a spatial resolution of a few nm. As a result, previously difficult mappings (such as Li-K and Mg-L) can be obtained with high sensitivity and high energy resolution, and this has become a measurement method essential for evaluating state-of-the-art materials. For example, with Li-K, it has been used to find that the Li-K subpeak on the low-energy side increased in accordance with the amount of charging, and the 54 eV peak characteristic of metal, and its distribution, contribute to evaluation of battery characteristics. The system also enables determination of the structural state in Mg-Li alloy, detection/evaluation of trace ultra-light elements in steel and ferromagnetic materials, and evaluation of differences in the state of each component in the micro regions of polymer materials. This research and development provided an evaluation technology, essential for developing more sophisticated materials going forward, in the area of evaluation/R&D on advanced materials which Japan is currently working on such as metals, polymers and magnetic materials. Furthermore, progress has reached the point where a precise measurement of physical parameter is being discussed, e.g., measurement of the mass absorption coefficient via low-energy electron beam excitation. Linkage with this kind of basic parameter research will be essential for expanding the analysis technique in the future, and it is expected that there will be significant development of electron microscope analysis due to the ability to perform characterization, even with bulk samples, of general micro regions, together with EBSD crystal information and composition information.